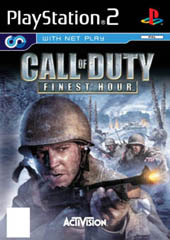 The original Call of Duty: Finest Hour was one of the most definitive PC war games on the market that took first person shooters into the realistic world of World War II that boasted amazing graphics, an intensive storyline and some of the best gameplay to hit the PC in a long time. 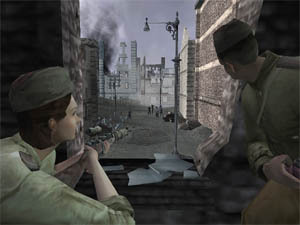 As with the original PC version, the PlayStation 2 version contains 3 different campaigns that include the Russians, British and Americans and although the storyline does jump around in the game, it does help give the gamer an excellent perspective of each sides representation of the war. The Russian campaign starts at the crossing of the Volga River where the Russian army attempted to force the Germans out of Stalingrad. This first mission is extremely reminiscent of the excellent war movie called Enemy of the Gates which Activision does an impressive job at recreating. The British campaign begins in the deserts of North Africa that set the British against the Nazi's in one of the deadliest arenas of World War II. Finally, the American campaign begins in the city of Aachen that has the Americans trying to recapture this town from the Germans. All these stories have been accurately taken from actual events in WWII which really give this game a true historical experience. 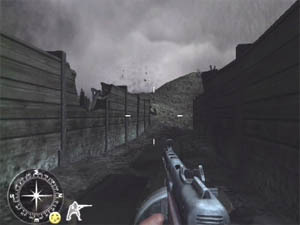 The gameplay of Call of Duty: Finest Hour features all the standard first person shooter controls that allows the player to access a variety of weapons and even different vehicles such as tanks and jeeps to help break the monotony of just running and walking around. To keep the game realistic, the player meets a variety of different AI characters that not only push the storyline forth but also assist you in completing your objects and as we all know, the war wasn't just won by one solo man. With that said, it should take the average gamer around 20 hours to complete with professional gamers taking a little less... however! The most noticeable problem with Finest Hour is the save system or lack of... which is confounded by the lack of checkpoints that really makes this title a frustrating experience, especially when you are trying to complete a level or find a checkpoint without being shot dead by a mystery sniper. I must also admit that this really affected the gaming experience of the title and I don't believe that a save system would of hindered the programmers or enjoyability of this title. The difficulty of the game goes up and down with the Russian campaign being the most difficult campaign, closely followed by the British. The audio quality of Finest Hour features some great character acting from Dennis Haysbert (24 and Heat) who lends his talents to this epic tale of World War II. Match that with one of the most fulfilling soundtracks of the year and a plethora of sounds from World War II such as the shouts and screams of German soldiers, the sounds of Panzer tanks firing into Russian buildings and of course a variety of authentic weaponry sounds and you have one great sounding game. In conclusion, Call of Duty: Finest Hour is a rather sturdy game on the PlayStation 2 but is dragged down by the slightly dated graphics, the various slow down issues and of course the lack of a proper save system which really makes this one fiddlesome title. If you're looking for a World War II first person shooter than you should check this out but if you are after a true first person experience of the new millennia then you may want to look elsewhere.